It never occurred to me that homeless people wake up to an alarm clock. The day before, I found Dave at Target — in the same spot we’d met the week prior. “Hey, how have you been?” I asked, shaking his hand and pulling him in for a hug. “Good! Yah, it’s good to see you!” he said, smiling at me. Then he paused. “No, actually, it’s been terrible,” he said, shaking his head. “What do you mean?” I asked, confused by the rapid change in his tone. Turns out that and Dave and his friends had suffered from the rain that blanketed Orange County the past week. The tarp sheltering them from the elements was so weighed down by rain, that it broke and dumped gallons of water all over him, his friends, and their belongings. “Wow, man, I’m so sorry,” I said. I asked if he was hungry. He nodded, so we crossed the street to Sonic Burger, and sat down to chat. “If I took you, could I help you get your ID?” I asked, wondering if he would take me up on the offer. “Oh, yah, definitely. I would for sure.” I made a mental note to follow-up on this later. “Do we need to head back?” I asked, noticing that Dave seemed to be wrapping up. “Yah, we should, ” as said as he gathered his trash and walked to a wastebin. As we crossed the street, Dave paused mid-thought. “I was wondering. I’ve been thinking about turning a corner. I’m wondering if I could come to church with you,” he said, looking straight ahead and squinting. Surprised — but happy to do so — we arranged for me to pick him up at 8:30 the next morning. “I’m just embarrassed, you know, going like this,” he said, looking at his clothes. Dave was wearing the same thing I saw him in the prior week. “Come on, let’s go,” I said, motioning him to follow me into Target. My intent was to get some toiletries to make him feel a bit more comfortable. “Yah, I do, I got that. But you know, people don’t realize that it’s the simple things we really need,” he said. We picked out shaving cream, razors, and then grabbed a 10-pack of socks. That night, I updated my Facebook status, sharing news of Dave’s unfortunate tarp break. Minutes later, I received a comment from Kristy, offering sleeping bags, toiletries, and other items to get Dave back in shape. Kristy is someone I’ve met through Dave’s and J’s stories on this blog. I can’t recall how we initially connected, but I know that it’s been sometime in the past 2 weeks. We made plans to meet the next day. Amazing, huh? The power of God working through social media. 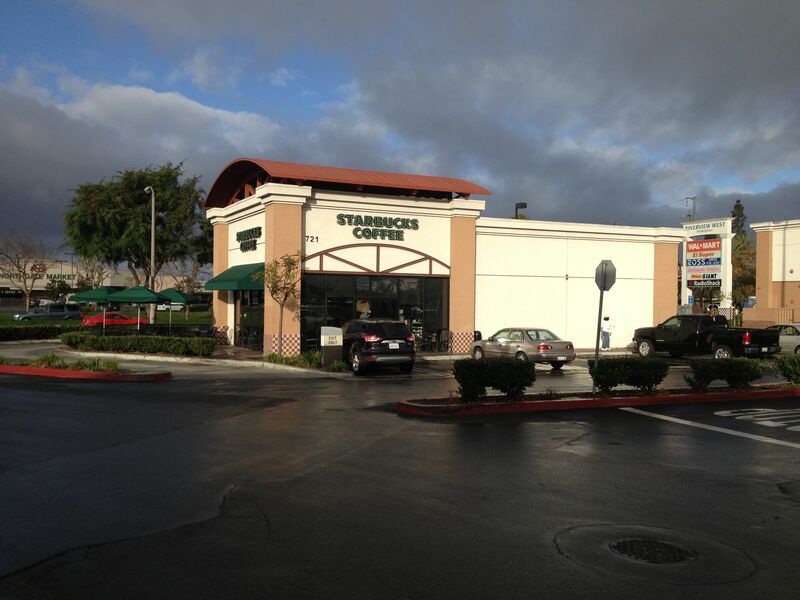 And so that’s how I ended up driving to a Starbucks in Santa Ana, picking Dave up at 8:40, and heading to Rock Harbor in Costa Mesa. As we waited at a red light, a light rain hitting our windshield, I mentioned how much I love hearing rain at night — but that it occurred to me that rain is his nemesis. He agreed. 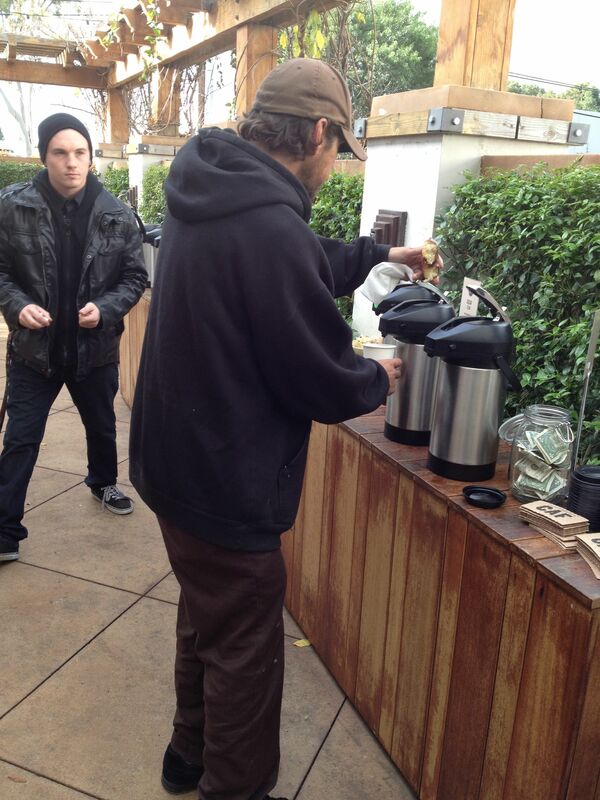 After parking, I led Dave to the church’s patio to find a donut and coffee. Clutching his donut, Dave poured himself a cup, adding some cream and sugar. “Dave, is that you?” asked a woman standing next to Dave. Surprised, I looked at Dave, wondering what I had missed. Turns out he had met her the day before at Target. She had spoken to him for a few moments, offering consolation and listening to his story. “What are the chances of running into her here?” Dave asked, as we made our way into the main center. I smiled. No such thing as random occurrences in my book. We found my wife in the front row (our usual spot), and sat down. I watched Dave interact with my wife, noticing his personable demeanor. With little hesitation, he easily broke into conversation. “How are you feeling about going back to work?” he asked, weaving in a topic I had shared with him the day before. Small talk: A skill that’s taken me years to develop, but one Dave seems to exhibit naturally. Impressive. 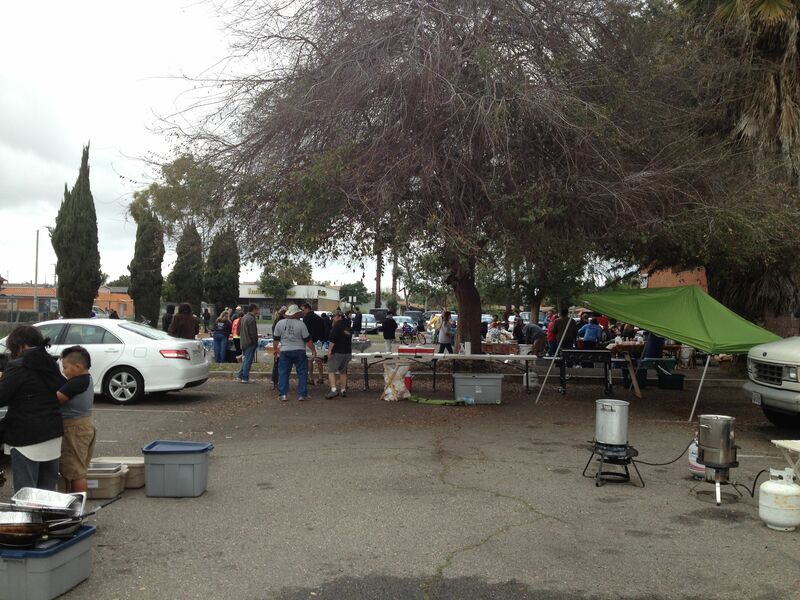 After service ended, we made our way to meet Kristy in Santa Ana, where she was in the midst of serving the homeless. Pulling into the parking lot, we saw about fifty men, women, and children milling about, some speaking to each other in small groups, others sitting by themselves. I passed a man sitting on the curb, with piercing eyes and a stare that made me shudder. You probably know the look – the look you image when you think of a crazy homeless person. I’m still not really sure at what point that “look” becomes part of one’s demeanor. Maybe I’ll find out. “Hello, follow me!” Kristy said, energetically motioning us around the back of an adjacent building. She led us to her car, overflowing with supplies. “I look like I’m homeless myself,” she said laughing, as she kindly asked Dave what he needed. As we talked, I noticed a woman approach a car in the parking lot, peer in the window, and walk around to the passenger’s side. “Frickin’ prostitutes man. There are kids around!” Dave muttered, shaking his head. Kristy’s kindness overflows — literally! 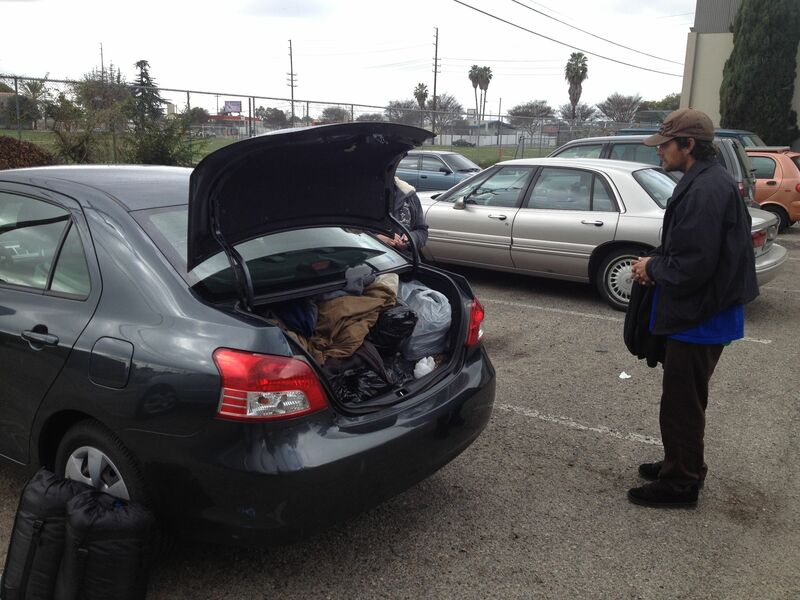 But on the bright side, Dave gained a new jacket, 3 sleeping bags, and 3 toiletry bags — all thanks to a stranger moved by his story on Facebook, and who happens to be passionate about helping people like Dave. Awesome. As we left, I asked Dave where he wanted to be dropped off. “Let’s go to Target,” he said, as we made our way down the 55 freeway, continuing to make easy conversation. I chuckled, and described my reasons. As we pulled into the Target parking lot, we made plans to again meet up the following weekend. I can’t wait. I’m not sure what’s going on with me. I feel like I’m drawn towards something with the homeless community. I’m not sure what I’m supposed to do, but things are coming together in a way that seems effortless. Connections between people are being made, communication is flowing, and resources are aligning. Whenever I’ve noticed this in the past, I’ve learned to stay available and let it happen. Also, through these interactions, I somehow feel more complete – more “centered.” It is difficult to describe, but I feel more comfortable in my own skin, like I’ve found a “true north”, even though I don’t know what it means to head in that direction. If you have some suggestions, please let me know in the comments. Spread the word by sharing the link to this post (tiny url: http://wp.me/p2VnXW-u3). Your comments and prayers are an encouragement. Contribute towards the $26 dollars Dave needs to get his ID at the DMV. If Dave gets an ID, he has a better chance of entry into the OC Rescue Mission, which will position him getting back on his feet. I feel that offering Dave an evening in a hotel to shower, shave, and sleep in a warm bed would be meaningful. I have no idea why I feel this, but I see a picture of him and his friends enjoying a night of normalcy — perhaps somewhere near a laundry mat where they can wash their clothes, or maybe through your kindness, we can get them some new clothes to feel human again. If you’re drawn towards helping Dave and his friends, you can click here to contribute. I’ve set up a Pay-pal account to accept donations of any amount. If no one contributes, I’ll take that as a sign that this wasn’t meant to be. If you contribute, I assure you that every cent will go to Dave and his small community. Now it’s your turn: Let me know what you’re thinking in the comments. This is so beautiful, Dave. I’m resting in my cot in the Pomona Armory & I’m putting the final pieces of this same journey together myself. He will need his birth certificate too. And that can be ordered online but it will take a week and he needs an address to mail it to. These are all the things that I have learned in the last 24 hrs. Look up the DMV requirements online & ask him if he has any of the others. He may need two forms of ID. also, there are subsidies for a state ID, I received one, but I’m going for a license. There is no subsidy for that. The subsidy pushes the cost to $9, but the birth certificate can be costly or as cheap as $21. Schedule an appointment at the DMV. OH YES! As for your blog: YES, YES, AND YES! I have a number for you and Kristy for the director for organization that runs the Armory. It is the BEST organization. The loveliest people. Dave may like it there. Hot shower. Hot meal. Toiletries. Every day. Just until he finds HOME. The hotel & laundry thing is so beautiful. I ache for that. After my run in with a difficult man & now with a stomach bug, the dignity & security & cleanliness of that GIFT would be enormous. Prior to homelessness, I gave to many of my dear friends or others in crisis. I took in a single mom & her two kids to add to my own three. I LOVED it. I took in a friend after her failed relationship. I took in a boy in the afternoons because he was better off in my home than on the street. It was ALWAYS because it was how I’d want to be treated if my world tumbled down. Mr. Rosendahl, you are my brother. Hi Elizabeth, thank you for the kind words and comment. I appreciate the insight you’ve provided about the Rescue Mission. I will certainly pass that on to Dave and see what I can do to help! I’m sure gathering all the necessary information can seem overwhelming. I hope you are feeling better; I didn’t know you were sick! Your welcome! It’s really cool to follow you as you enter into Dave’s journey & how THAT moved me so much, and still now, as Dave and I are getting our prerequisites out of the way! I’m from out of state & I drive, so I had to have a current passport or birth certificate AND a current driver’s license or ID. But, of course, I thought that I could do one without the other and so forth and when I finally sorted out the steps necessary, I could act. I’m guessing that Dave is a native Californian & that he can get a birth record for $21 & ID @ the DMV as you know. There are time issues with both. See if you can schedule the DMV appointment for him. The earliest that I could get was 2/20. The wait is at least 2 hours for walk ins. This is what I’m doing first thing tomorrow (Tuesday). Once you have his ID, you’re set! I still have to situate my car & that has been troublesome. My car is my ability to see my kids & find work in Claremont. I need to secure it for six months until I can use it again. It’s OCRM policy. Last week, I was harassed by a man at the shelter, I became very sick with the intestinal bug that’s going around and my relatives had my son & daughter for the weekend. I may not see them before I get into the mission and I will not have visitors or phone calls for 30 days. My relatives knew ALL of these things and they did not enable me to spend time with my children. The custody order is very fair and it is clear about mutual decision making between the father and myself. Being excluded like this, at this time, when I felt the MOST vulnerable… brought me to my knees. This process is hard. Change is hard. I have found that simply getting to the starting line, to be an enormous challenge! I’m so glad that Dave has YOU! Whom do I have? God’s clear and ever present guidance. My unique, huge hearted, & gorgeous Facebook family… and even more that I email! And my kids, who have been my three greatest loves on earth! Welcome home! After reading your newest blog I wanted to invite you to come serve with me on Sunday morning if your able. Dave is welcome, as is your wife. Id also like to talk to you more about some of the things I am doing to help this community. I can’t get it out of my head that God crossed our paths crossed for a reason. Also, do you know if Dave has an physical address? He will need one to get an ID. Micah’s Way in Santa Ana will help him get one. If you send me you email address I can send you the info. We can also try to get Dave into the Salvation Army shelter for 2 weeks if he wants. Hi Kristy, thank you:) Vegas was great from a business perspective! Thank you for the invitation for Sunday morning. Unless I hear otherwise, I’m picking up Dave at 8:30 like last week, so this Sunday may not work — but I will definitely take you up on the offer. You mentioned that Saturdays are also a possibility, right? I’d also love to speak about what you’re doing and see where we are aligned. Regarding Dave having an address, I don’t think he does. Thank you for the suggestion re: Micah’s Way, I will pass that along. Does it cost anything? Dave mentioned that the Salvation Army he visited was shut down. Which one are you referring to? Hi friends, we’ve already raised $100 towards the causes listed on this page. I thinks this covers Dave’s ID cost, and we’re making great progress towards a night in a hotel. I’m blown away! Thank you! Friends, we’ve now raised $276 towards the causes. I’m pretty sure this covers Dave’s ID cost, and should cover the night in a hotel. I think there is also enough to do some shopping at Target for new shirt, pants, etc. I know there are some additional costs to prepare Dave for his OC Rescue Mission interview, so I’m sure we can help there as well. We might also be able to help the 2 friends he sleeps under the bridge with. We’ll see what others contribute and take it from there. I can’t wait to share the news with Dave, and show him your love. Please let me know if you have any suggestions on how to handle this.